It’s funny how things catch on. Kuip makes one remark during a broadcast about me looking like a baby giraffe – I guess I looked a little wobbly chasing down a fly ball in the outfield — and everybody loved it. Now I see signs all over. Even when I was down in San Jose and Fresno, I saw Baby Giraffe signs. My wife Haylee thinks it’s hilarious. When I was a kid, girls use to tell me I looked like a monkey. I’ve been called animal names all my life. So as you might imagine, I like Baby Giraffe a lot more. It was their way of saying, “We love you how you are and it doesn’t matter if you’re the most awkward guy in the world.’’ Those T-shirts might have been the weirdest way possible to send me that message of support, but it felt great to see them there backing me, wanting me to do well. One of my friends said he was offered $100 for the shirt and he would have sold it if he had another shirt to put on. It was crazy. After the game, I went to get a bite to eat with a whole crowd of family and friends. I thought I had really let them down. But nobody was disappointed at all. They were just happy that I was there. It was just an awesome feeling and that made me so much more relaxed on Sunday. I had a good game — 4 for 5. When I hit that three-run homer, it was such a load off after scuffling so much. That really helped me relax – and helped me get three more hits. But the Astros were making so many great plays. They threw Nate out at the plate from the outfield wall. They made a great play at third and got us caught in a rundown. It seemed nothing was going our way. But we didn’t make excuses. We didn’t complain. We just grinded it out. And we pulled it out in the end. Now that I’m five months into my first year in the majors, I’d say there are two major things I’ve learned. One is you have got to be confident up here. Got to be comfortable. You can’t get down on yourself. If you do, everybody’s going to leave you behind. The league’s going to keep on going and you’re going to get stuck behind everybody else. So even when you’re having a tough time and you’re not feeling confident, you’ve got to give the outward appearance that you are. Last year in fall league, our hitting coach’s slogan was “Fake it til you make it.’’ If a pitcher sees in your body language that you’re not confident, they gain more confidence and make pitches they normally wouldn’t make. So even if you’re 0-for-20, you still have to act like you’re going to get it done. The other thing is to be more aggressive at the plate. You have to be way more aggressive up here than down in the minors. I’m learning a lot by watching how the veteran players handle setbacks. Obviously, with all our injuries and our offensive problems, it’s hard not to get down. But guys come into the clubhouse every day with a new attitude. Our mindset is if we can keep within a few games of the Diamondbacks, we’ll make up ground when we get some guys off the DL. Guys like Mark DeRosa make sure we keep things in perspective. Today is just today. We still have 30-something games left. OK, I’m going to text Haylee to remind her to bring “Keep Belt Awkward’’ T-shirts for Kruk and Kuip. Maybe Baby Giraffe T-shirts will be next. So that’s another thing I’m learning: You’ve got to laugh at yourself. Take the game seriously, but not yourself. Do YOUR know where baby giraffes come from? Your writing certainly isn’t awkward! Great story, thanks for sharing. We SF Giants fans are going to love you for a long, long time, and not just because you’re good–and you are–but because you’re REAL. You’re articulate and can laugh at yourself. Your parents’ T-shirts in Houston showed us that you come by this honestly! We never stopped loving our Panda even when he scuffled last year, and we’re going to love our awkward Baby Giraffe, too. Giants’ fans appreciate a good story and a great personality. As to performance, great job last night against the Padres. You looked great on the triple and on the stolen base later. As for being doubled off first, well, rookie mistake. We still love you anyway. Stay well, stay sane, and stay AWKWARD! Brandon, we’re so glad to see you settling in recently. You’ve got a ton of fans behind you, and there were even some giraffe hats in the crowd at last night’s game! Keep up the good work, my friend. We’re glad you’re in the big leagues again! Finish strong, and don’t give up! I watched you at UT and now get the pleasure of watching you with the Giants. Where can we find we find “Keep Belt Awkward” T-shirts? Thanks for sharring your story also! The Pablo Style Giraffe hats are gonna be a huge hit just watch! So glad you’re here, and so glad you’re so honest. No one’s laughing at you, you Awkward Baby Giraffe… we all love you. Stay strong and keep swinging! Brandon, it is so good to see a fresh new face and someone who really wants to play. There will probably be a lot of Giraffe hats in the crowd. The Giants are turning into animal kingdom. Keep up the good playing and writing. Did ya see the giraffe hats?? It starting to look like a zoo in the stands, with panda and giraffe hats. I love it. I Need an Awkward Giraffe t-shirt!! I enjoy your writing almost as much as I enjoy your play on the field — great post! As a die hard fan, I can safely say I feel better when you’re in the lineup! I saw the Baby Giraffe hat at the game last night and loved it! Between you and the Panda we’re starting the Giants Zoo. *lol* Loved your post. Well-written. We’re glad you’re here. At the game last night I saw Giraffe hats in addition to Panda hats. Aww, we love our Awkward Baby Giraffe! You’re awesome and have a great personality to boot. Keep up the good work and I KNEW that we’d be calling you back up. You’re here to stay kid. Brandon…much props to how you are handling your pro career. You play the game the right way and have a sharp focus that will grow your success. Hearing Will the Thrill comment on how he thinks your swing is even sweeter than his is awesome because he had one of the sweetest lefty swings of all-time. Bro keep on doing your thing and we all look forward to you being a lifetime Giant here in the city by the bay!!! I am so happy to not only see you back up in the majors, but putting on a show as well!! I was impressed when I saw you at Spring Training, and have been rooting for you ever since. I look forward to many years of “awkward,” and frankly hope it never goes away….. And I would wear the t-shirt – but not a fan of the hat. What a wonderful look into your feelings on, and off the field. As an awkward person myself, I completely understand “what did I just do?” moments. I love this blog! You really are great with your writing. Also, I think you have just been amazing in every way this season. Moving back and forth from Fresno to SF has to take its toll and I’m sure a lot of players get rattled by it all. You have carried yourself so well and I love how you are always staying positive! Keep Belt Awkward is my new favorite catchphrase! Stay awkward and stay awesome!! Its always refreshing to see a young man like yourself, come up to the show, and give it the respect it deserves. Enjoy the ride, and may it last for many many years to come. Brandon you’re a doll! What a great story! I look forward to watching you as a Giant for many years to come. Stay awkward! Go Giants!! Brandon – I’m a season ticket holder to UT baseball and a life long Giants fan. I can’t wait to see how your career progresses. Hopefully, it will involve the Giants and a couple of rings. And of course keep on laughing at yourself. Go Giants, and Hook ‘Em! whod’ve ever thunk it, Baby Giraffes from Texas? keep up the great work, kid…we LOVE YOU!! Great blog Brandon. If a baby giraffe was a bad thing then you wouldn’t be in the majors. I think you fit in just fine with the Giants. Keep up the great work! Go Giants! Welcome! ABG SFG = HGF (Happy Giants Fans). The fans knew you were right for the team from the beginning. You may be awkward, but you have a lot of wisdom for a young person. Stay comfortable with who you are. Down deep, where it really counts, you ARE self-confident about the important stuff. 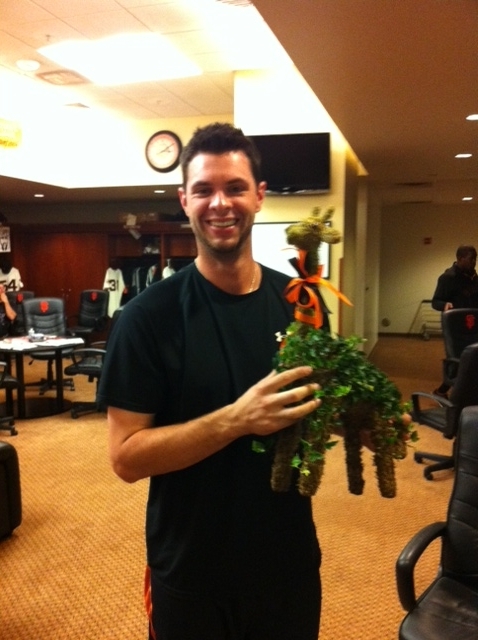 Our friends got a great pic with Brandon Belt at Raley Field in Sacto this summer but #babygiraffe belongs at AT&T. I just ordered a giraffe hat online (amazon.com) so my 11 year old daughter and I can wear the panda and giraffe hats together (while my husband laughs at us) when we all watch the games on CSN together. Go Giants! Welcome to the Bay Area! Almost everything K&K say sticks! By then time you leave here (20 years down the road) you’ll have more nicknames and saying about yourself then you can count. My niece loves the baby giraffe nickname… She is 11 and is already 5’7 and hopes her friends come up with something equally as cool for her 🙂 Good Luck with the rest of the season. great job, brandon! it looks as if your confidence is growing stronger and stronger game by game! you will be an integral part in the giants making it to the playoffs. stay strong! Thank you for such a great blog post. I’m glad to know that you don’t mind the Baby Giraffe nickname! If you – and my fellow fans – are looking for some baby giraffe shirts, I’ve designed a few. Please consider checking them out! http://bit.ly/q5IGwC It’s been a crazy year, and I couldn’t be happier you’re supporting this team through the push for September. I am so happy that Boch and peeps finally realized that you need to be here and play everyday. You’re the jolt of lightning that the Giants need right now. My friend and I had a brilliant idea to buy baby giraffe hats to go with all the panda hats out there. I was so excited when we found some last night and then I saw that somebody beat us by wearing it to the game. I will still proudly wear my hat to the game in full support you. Can’t wait to see what your future holds as a Giant! And your bat has been working wonders for us. We needed a firecracker So bad and thus far you’ve been answering the call. No complaint about your left field play either. All in all you really been coming through for us. That was ruff blow getting sent down on your birthday earlier in the year.Thanks for keeping your heart and mind Orange and Black. I don’t think there’s any question you’re the first basemen of the future for the g-men. We’d love to get some giants lockeroom pranks on the GoT HeeM Blog. Check us out and keep us in mind. We’ll have a Belt Heem post as soon as mlb clears the footage for sharing. Keep it up and welcome to the SF zoo ! I am going to show this to my 11 year-old son tonight! We live in NC and are big Giants fans! We took a vaca to Cali this summer and he got to go to a game on his Birthday and soooooo wanted a Tim Lincecum autograph (his fav player). Tim was not starting that night so we thought it was possible. Tim just ran right by him into the dugout and didn’t say a word. You came right up and gave him an autograph. It is a lifetime memory he will not forget. He is watching you now and I think you are becoming a great role model!!! Thanks! Hey Brandon. Keep up the good work. Been rooting and pulling for you since you first showed up in our lineup. Now, where can I get a t-shirt? Would love to proudly wear one. Let all of your fans know. so inspirational, just keep going, look forward, not back…. Thanks for posting! Don’t let this hack-tastic team get to you. The fact that you are patient at the plate is what makes you better than almost everyone this team has put out there over the last several years. Taking walks and not making outs is important too! No more .270 OBP lead off hitters, please. Hey, Brandon, you’re an incredible person, and we all just hope you DO stay awkward! You’ve made a tremendous addition to the team and DO stay confident out there! Your NORTH state (Cottonwood, CA) fans! That has to be the single cutest thing I have ever read…. None of your fans will EVER be disappointed in you!! We love you through the ups and downs! The Giants are going to catch on very quickly, those “Keep Belt Awkward” shirts will be huge very soon!! Baby Giraffe is the cutest nickname ever and it definitely suites you! You don’t look like a monkey at all!!!! 🙂 Your aggressiveness has been VERY apparent your last two times up to SF. The best part I think is that you didn’t go Pablo about it (my family’s way of saying hacking away at every pitch no matter what). You have found a great balance, and haven’t lost your incredible eye. That is a true gift, like nothing else in the league. I’ve met you three times now, and each time you seemed very confident, even when you were on the DL. That is very admirable, especially knowing that you didn’t feel confident. You should feel confident, you deserve it. You ARE all that!! And even Willy Mays had oh-for days. You see Barry Bonds cheering for you yesterday?? That’s exciting!! I love you Baby Giraffe, play hard!! This is a great blog. You are doing great, we are very proud of you and your accomplishments. I guess I need to go get me a t-shirt and then find me a giraffe hat. Keep up the good work. Love this post! You have a great attitude and you’re quickly becoming a fan favorite in the Bay. Looking forward to many more years of baby giraffe hats and shirts! You are so resilient at your sport. 🙂 I love reading your blogs.Thank you for sharing your wonderful stories and insights. Hey Brandon, Your one of my Favorite Giants. You have a great work ethic and attitude. And you sort of remind me of baseball players from a different era. Kind of a throw back. That’s not bad. Giants, Longhorns, Baby Giraffe….can’t beat that! I was so excited when you came up to the Majors this season! I had been paying a lot of attention to you last year in the minors, because I could tell then that you were a tremendous player. I totally understand being an awkward person, but just for the record I have yet to really see that in you (shy and quiet maybe, but it never translated to awkward until this whole incident…). I believe in you, and your ability to play the game (and play it well), and in the Giants this season (and every season). Im glad that you aren’t taking the Baby Giraffe thing too hard, because really, I think its a wonderful thing. You’ve gotten the attention Kruk & Kuip, the rest of the team, and the fans enough to have earned yourself a nickname! 🙂 Just know that its all in good spirits, and that San Francisco (myself included!) really does love having you on our team. You’re awesome!